Description: What a scoundrel wants, a scoundrel gets. . .A decade ago, the Marquess of Bourne was cast from society with nothing but his title. Now a partner in London's most exclusive gaming hell, the cold, ruthless Bourne will do whatever it takes to regain his inheritance--including marrying perfect, proper Lady Penelope Marbury. A broken engagement and years of disappointing courtships have left Penelope with little interest in a quiet, comfortable marriage, and a longing for something more. How lucky that her new husband has access to an unexplored world of pleasures. Bourne may be a prince of London's illicit underworld, but he vows to keep Penelope untouched by its wickedness--a challenge indeed as the lady discovers her own desires, and her willingness to wager anything for them . . . .even her heart. I don’t tend to read a lot of historical romance, but after seeing so many people rave about The Rules of Scoundrels series by Sarah MacLean I decided to give it a go. I’m glad that I did because this book was an absolute gem. 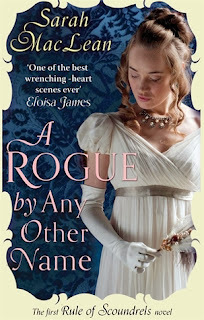 Combining humour, defiant characters, scandal and swoony romance, Sarah MacLean has written a fantastic historical romance. One that I would recommend to everyone. The characters are the heart of this book. The romance and plot is entirely driven by the choices the characters make. Bourne and Penelope just leap of the page and immediately pull you into the world surrounding The Fallen Angel and its illustrious owners. Told from both Bourne and Penelope’s points of view A Rogue by Any Other Name is Bourne’s story of vengeance and retribution. Ten years ago Bourne lost everything in a card game except his title. Now he’s part owner of the gambling hell, The Fallen Angel. The only thing Bourne wants is revenge on the man who took everything away from him. His plan involves getting back everything he’s lost and the only way to do that is to marry Lady Penelope Marbury. As it turns out Bourne’s path to revenge involves falling in love with his wife. This is a historical novel set in a time where women were not given much value and were expected to be proper. However Penelope is not a meek, quiet sort of a person. She was bold, had a backbone and played the game masterfully. She’s pushed into an undesirable marriage but she sets the stakes and makes sure she gets everything she wants out of it. Essentially Penelope is the hero of this story and not her male counterpart. She’s the one that saves the day making this story much more interesting. MacLean writes such complex, conflicted characters whose actions drive the plot and whose weaknesses prevent them from having a happy ending. Bourne is driven by revenge when we first meet him, but as he gets to know Penelope his priorities change and he learns a few lessons about himself. He starts of as a terrible husband. I loved that Penelope didn’t put up with his crap. Their relationship at the beginning was tumultuous. Definitely a push and pull sort of a relationship. As the story goes on Bourne changes his ways. In the end both Bourne and Penelope change each other and grow together. Bourne learns that there is more to life than revenge and Penelope learns to be bolder. Plus the tension in this book is thick enough to cut with a knife. The romance is defiantly steamy and swoony. The Fallen Angel was the perfect backdrop for this story with its numerous secrets and vibrant staff. I can’t wait to see what other secrets it holds. There were letters at the start of each chapter that were written by Penelope and Bourne. There were a good way to get to know the characters and their back-story. They gave the characters depth. A Rogue by Any Other Name was a fantastic historical romance. A must read for fans of the genre or anyone looking for a romantic read.